The goal of this study is to contribute to the recent trend of understanding plot as the organizing principle of biblical theology. As such, it engages in two levels of inquiry. First, this study explores plot and its role in shaping historical narratives. Because plot is necessarily mimetic, it has long been perceived as problematic for historical narrative because of mimesis’ alleged tendency to distort reality. Here an argument is presented that sees mimesis, and thus plot, as an isomorphism of reality. Plot is the transferal of reality into the domain of narrative through literary convention in such a way that truth is recoverable. In addition, because plot is the arrangement of events into an Aristotelian “single act” it is the organizing principle of the narrative and thematic progression from tension to resolution. Second, this study looks at the plot of Genesis as setting the plot of Scripture in motion. 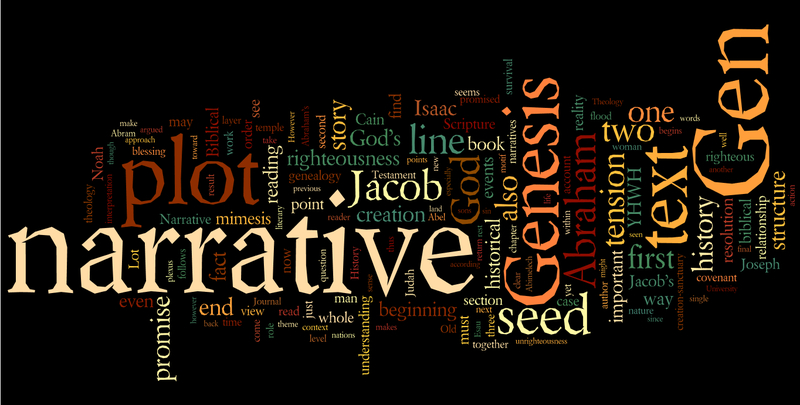 Genesis has its own complete movement from tension to resolution that contributes to the plot of Scripture as a whole. The plot of Scripture is tentatively identified as the quest to return to God’s creation-sanctuary of rest and the narrative indicates that this will take place through the promised seed of the woman. The plot of Genesis is identified as the need for the seed of the woman to be righteous and survive. This is emphasized throughout the narrative while the seed’s actual righteousness and survival are increasingly brought into doubt, eventually reaching climax in the Joseph narrative. The tension is resolved when it is shown that YHWH himself will ultimately ensure the righteousness and survival of the promised seed. The argument for the plot of Genesis bolsters our initial reading of the plot of Scripture and the view of plot presented in the first level of inquiry, thus providing support for plot as the organizing principle of biblical theology.